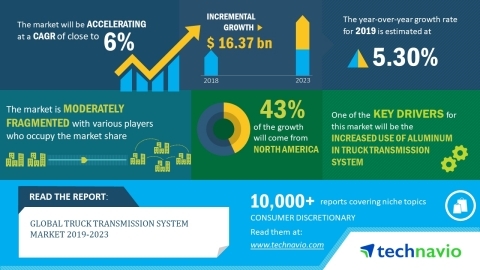 LONDON--(BUSINESS WIRE)--The global truck transmission system market research report by Technavio predicts the market to post a CAGR of nearly 6% during the period 2019-2023. Factors such as the increasing sale of trucks and growing penetration of automatic transmission system in trucks will contribute to truck transmission system market growth. Furthermore, the growing use of advanced technologies in transmission system in terms of design and development and the increased use of aluminum in truck transmission systems will boost market growth. As per Technavio, the rising adoption of all-electric powertrains will have a positive impact on the market and contribute to its growth significantly over the forecast period. This global truck transmission system market 2019-2023 research report also analyzes other important trends and market drivers that will affect market growth over 2019-2023. In developed automotive markets such as the US, Norway, Poland, and the Netherlands, the demand and sale of all-electric cars have been increasing rapidly. Increasing sales of electric cars is also being witnessed in developing automotive markets in APAC as well. This has led prominent players in the market to focus on developing all-electric powertrains for commercial vehicles such as pickup trucks, medium and heavy-duty trucks, and buses. In the last few years, OEMs of commercial cars are focusing on the development of all-electric trucks. “The developments in the field of powertrain have been assisting in enhancing the overall performance and efficiency of trucks. This has resulted in vendors using innovative materials, advanced design, and increased number of gears to design and develop the electric truck transmission system,” says a senior research analyst at Technavio. This truck transmission system market analysis report segments the market by application (light-duty trucks and medium and heavy-duty trucks) and geography (APAC, Europe, MEA, North America, and South America). The light-duty trucks segment held the largest truck transmission system market share in 2018. The high demand and production of light-duty trucks in North America has been driving the growth of this segment. North America accounted for the highest share of the market in 2018. The use of advanced technologies to improve safety and vehicle dynamics has been promoting the adoption of automatic transmission systems in pickup trucks in the region. The global truck transmission system market will post a CAGR of nearly 6% during the period 2019-2023.